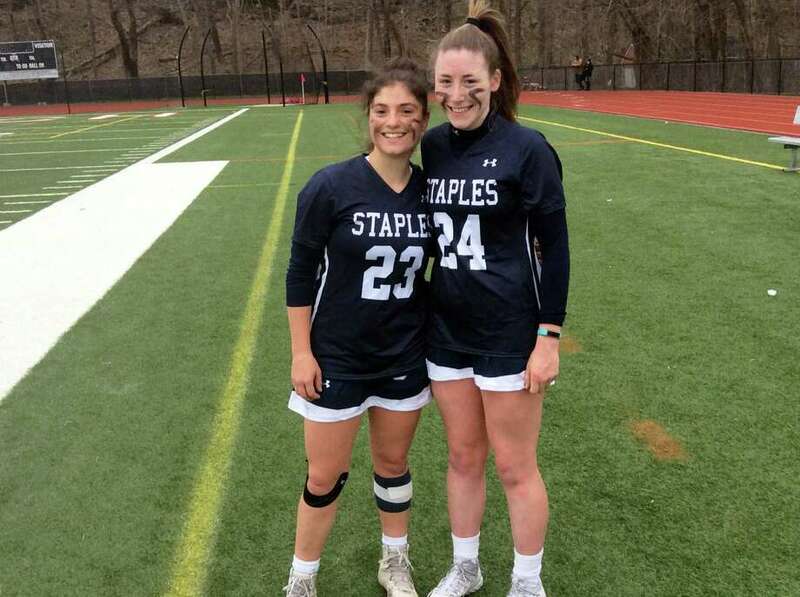 Shira Parower, left, and Kyle Kirby, powered the Staples High School girls lacrosse team to a 16-10 win over Greenwich on Tuesday, April 2, 2019 at Cardinal Stadium. The high-scoring tandem were difficult to defend throughout, scoring six goals apiece, making it a happy FCIAC-opener for their squad. Kirby, who has committed to play lacrosse at Notre Dame, recorded six goals and two assists, while Parower tallied six goals and three assists for Staples (2-0). Junior Kathleen Cozzi tallied twice, while senior Elle Fair and freshman McKenzie Didio notched one goal and one assist apiece for the victors. Kirby put an 8-meter shot past GHS goalie Sloane Loveless, then Cozzi scored on a catch-and-shoot after receiving a pass from behind the net, giving the visitors an 11-7 advantage with 14:05 left in the second half. Vallarelli knows the loss was a good learning lesson for her squad. Kirby and Parower paced the Wreckers offensively in the opening half, then helped them finish with a flurry with clutch goals throughout the game. At the faceoff circle, Kirby also won a good amount draws, enabling the victors to gain possession at key moments. Records: Greenwich 0-1; Staples 2-0; Scoring: S — Shira Parower 6 g, 3 a; Kyle Kirby 6 g, 2 a; Kathleen Cozzi 2 g, 1 a; Elle Fair 1 g; McKenzie Didio 1 g; G — Grace Fahey 3 g, Paige Finneran 2 g, 2 a; Leah Caputo 2 g, 2 a; Kate Loughran 2 g; Grace Collier 1 g; Delaney Roth 2 a.